BY DAY he is a leading Welsh musician who was mentored by Sir Tom Jones on BBC One’s The Voice. 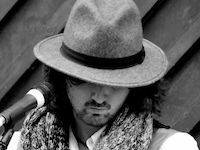 A finalist in 2018 Song for Wales competition, Gary ‘Ragsy’ Ryland is rapidly developing a reputation as one of Wales’ emerging recording artists. But fans of his music might be surprised to find out the artist - known as Ragsy - is also a trained chef with a long-standing fascination for Welsh cookery. It’s these two passions that will bring Ragsy to this year’s Mold Food & Drink Festival where he will take to the stage alongside a host of local bands and performers, providing the musical backdrop to the two-day festival. Ragsy said: “Not many people know that I started out as a chef and studied Welsh cookery. Music and food go well together and I’m fortunate to be able to combine my two passions. “I have a collection of around 150 Welsh cookbooks and for a relatively small nation, we have a fascinating food history. In many ways, the Welsh were culinary trendsetters, the first to come up with the idea of salted butter which was sent by train to England. Ragsy will perform on the Saturday alongside Flintshire artists including Mold Town Concert Band, Northop Youth Band, Cor-y-Llan, Random Start and Bethlehem Casuals. Mold Food & Drink Festival chairman John Les Tomos said the music stage was one of the festival highlights. “We’ll have a new stage and a fresh line-up this year, a platform for the best local talent and emerging Welsh artists. It’s also nice to welcome people like Ragsy who have a strong interest in Welsh cuisine and for whom meeting and supporting the producers and exhibitors at the festival is as important as taking part,” added John. Faulkner and held on Mold’s New Street Car Park on September 15-16.